ChromaKey refers to the technique popularly known as ‘blue screen’ or ‘green screen’, that removes background from a picture to allow another scene to appear in that space. Rear Projection (back projection) refers to the technique of standing the actors in front of a huge screen which projects a moving scene behind them. By the 1930s it was possible to film actors on huge ‘sound stages’ using ‘rear projection’. They acted in front of a giant movie screen and this was filmed. The result was a film of a film. Giant sound stages with life-size props were state of the art. They were often indoors with artificial lighting and wind. The chromakey was a technical solution developed in the 1940s. It used optical filters to eliminate the blue parts of the image. Digital processes now make this commonly used today. It can be done on our laptops. 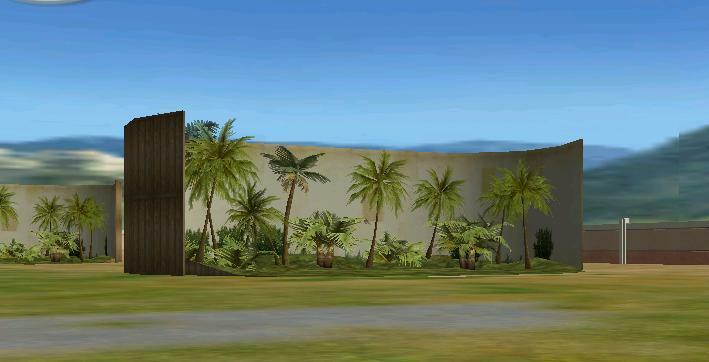 Modern computers make both chromakey and rear projection techniques possible. The computer screens available to you today do not ‘flicker’ as did earlier models. This means that you can do a rear projection movie just as was done in the 30s. Simply suspend an actor (puppet, model, or miniature) in front of a moving picture on the screen and film this to look quite real. The same effect can be achieved by filming the actor in front of a blue coloured screen. It can be a piece of blue paper, tarpaulin, sheet, table cloth …etc. This is then combined using chromakey software with a background scene filmed separately. The main limitation of the chromakey approach is that it takes a lot of computing power to combine the images and there is some loss of quality as the computer has to mathematically combine all the images. The rear projection method is easier as it is filmed all in one go so the only limit on it is the quality of background screen and camera you use. Use a puppet to make your first movie. A plastic toy dinosaur is ideal. Or it can just be your hand or a picture taped to a pencil – any sort of puppet that you can move to act out a little play or discussion. Next obtain a moving picture image. This can be anything that you can get up on your computer screen. The image needs to be large enough that you can hold the puppet in front of it. A DVD, clip art sequence or any sort of movie background will do for practise. Set up your camera on a tripod or get someone to hold it steady. Focus close in on the computer screen so that you can’t see any edges – so it looks like the real thing and not a computer image. When you’re ready to film hold the dinosaur actor in front of the screen and start the camera. Do a short clip first to see if everything focussed correctly. You may have to practice to make sure that the actor doesn’t cast a shadow on the screen. You may have to move the lighting or the computer screen. You may have to move the actor in closer or further from the screen. Use this movie to compare with the chromakey movie you will make as your next project. Chromakey software comes built into commercial video-editing software such as Adobe Premier, Avid, Serif MoviePlus, Ulead VideoStudio and others. It can be obtained for iMovie on the Mac. To get started, you can just use Windows MovieMaker. To do this you need to install a software ‘patch’ in the shared files to make blue screen available as a ‘transition’ between scenes. Copy the following code into Notepad and save the file as ‘bluescreen.xml’. That file then needs to be moved to My Computer>Local Disc C>Program Files>Movie Maker>Shared>AddOnTFX. If no AddOnTFX folder exists, create it as a new folder. Place the background movie first on the timeline. Place a movie filmed against a blue screen as the second movie on the timeline. Drag the bluescreen down to the transition timeline. Stretch it using its handles until it fills the background sequence time. Play the movie to test it. This should first be done with simple still images to save time so that you can see that everything is working. Otherwise you will have to wait while the movies render, which wastes time. Filming with a blue screen is mainly about getting the lighting correct. Any bright spots like reflections will not be seen as blue. On the positive side, any blue background can be used such as blue paper, sheets, pool covers. Even a clear blue sky can be used! A result similar to chromakey can be obtained using animated .gifs. This graphic format allows ‘transparency’ within an image. This is mainly for use on Web pages so that a small animation can appear on the page without a square box around it. But it does not need to be limited to Web use. The technique can be adapted to combine scenes for a movie. It requires animated .gif software, some of which is freeware. One advantage of animated .gifs is that the transparency can be any colour, including blue, white or black. So your blue screen shots can be used to make animated .gifs. The other big advantage is that animated .gifs can be placed, even layered, into PowerPoints to make complex animated scenes. The background movie needs to be played in a viewer of some sort. PowerPoint makes this fairly easy as animated .gifs can be layered on top of each other by using the ‘Draw>Order>Bring to Front’ to position them. The PowerPoint can be played and filmed directly from the screen. A sound track can be either played within the PowerPoint or added in by the video-editing software. You could even film a puppet in front of the PowerPoint show making it easy to create complex sets of moving images. 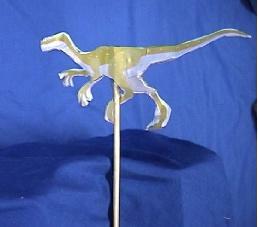 For example birds or pterosaurs (.gifs) could fly in the background of a dinosaur movie with a live-action puppet in the foreground. There are thousands of clip art animations available that could be added to the PowerPoint slide. By combining puppets, clip art .gifs and your own animations it should be possible to create complex movie sequences quite quickly and easily. 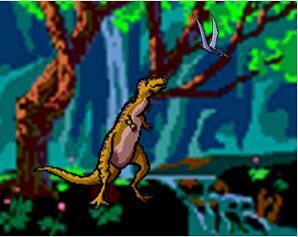 To see how easy it is to create a simple dinosaur movie from clip art use PowerPoint. Just use ‘Insert>Picture>Clip Art’ to search for a background movie image using ‘Search For>Selected Media File Types’ as ‘Movies’ only. That will show you a collection of animated .gifs. Look for jungle, forest or whatever you want as the background. If none of these are suitable, go to the Web and search for some free animated .gifs, download the one you want, and import it into PowerPoint as ‘Insert>Picture>From File’. Stretch your background .gif movie to be large enough to hold the actors and check that it plays in PowerPoint ‘Slide Show’ mode. Once satisfied, follow the same procedure, searching for ‘dinosaur’ as the topic for the animated .gifs. Paste these dinosaur .gifs on top of the background .gif. If necessary use‘Draw>Order>Bring to Front’ to get the right ones on top layer. You can use ‘Custom Animation’ to make the .gifs follow a ‘motion path’ across the screen. The .gif format is very versatile. Most animation and video-editing software can save in .gif movie format. The Kahootz animation programme can play these .gifs within its props and scenes. Animated .gifs can then be easily stacked and combined in PowerPoint to put animated and live characters in animated scenes. To use them in a movie these can then be screen-captured with software or filmed from the screen with a movie camera.